So, All-Star Batman #1. I guess it’s called that because of the creative team, Scott Snyder and John Romita, Jr. But the name also evokes the horrible, and never completed, All-Star Batman and Robin. Well, I can say without equivocation that All-Star Batman is better than All-Star Batman and Robin. Of course, that can be said about pretty much any book. Perhaps my view is slanted. 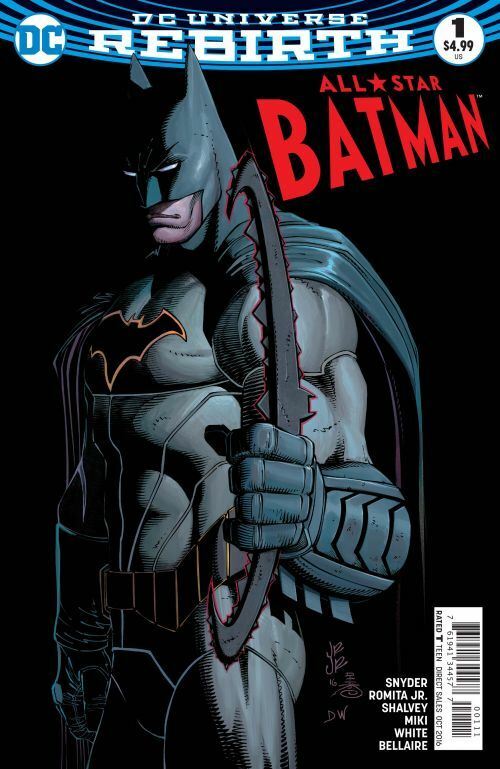 I didn’t particularly enjoy Snyder’s run on Batman, and so was not likely to enjoy this new series. And I don’t. I do love the art, though. The cover is great, and throughout it every panel is superb, the colouring is excellent as well. And there are occasional scenes which I enjoy. I have to admit that. The story begins midstream, and then jumps back, and forward, and back, and forward. That can be used effectively, it’s not like I demand linear narrative at all times. And it does create a bit of suspense as the reader tries to figure out what exactly is going on. But the disjointed narrative seems overly done, far more than was needed to tell the story, and jarring simply for the point of being difficult to follow. The plot can be summarized pretty easily, really. Two-Face is out on another deadly spree. Batman stops his first plan, but Two-Face turns the tables by promising a huge payoff to anyone who kills Batman. Not just criminals take up this offer, ordinary people do as well. And it’s those moments, where regular folks turn on Batman, that are the best moments in the tale. What is done extremely poorly is the use of the other villains in the story. Firefly, Killer Moth and Black Spider all have small roles, trying to kill Batman. Yes, none of them are major leaguers, but in this story they are nothing more than names and costumes. There is no hint of personality, and by and large they do not even use any signature moves or weaponry. And I wish they would just decide what they are going to call Duke, if not Robin. The fist bump scene is cute, but just give him a name already. Nor am I left, at the end, hoping this will pick up with later issues. As I said at the start, I didn’t really care for Snyder’s run on Batman, and this feels like it will be more of the same.